Rebecca J. Carlson: Is That Your Bird In There? Is That Your Bird In There? My four-year-old had a friend over to play this afternoon. As her mom and I were chatting, the little girl came over and asked me, pointing to the fireplace, "Is that your bird in there?" Both of my pet birds were safe in their cages. I gave the little girl an indulgent smile, "What bird?" She pointed at the fireplace again. I tried to see what it was that might look like a bird to her. The huge terra-cotta pot packed with dried coriander stems? No. The logs in the fireplace? I peered into the darkness behind the smoke-stained glass. Something blinked at me. "There's a pigeon in there!" A gorgeous, green, purple, and grey bird perched on top of the logs, cool as anything--like he owned the place. He must have flown down the chimney. It was so dark in there I never would have seen him if my son's little friend hadn't pointed him out. After I took a picture, I went out to the garage to get a pair of gloves. I thought catching the bird would be easy. 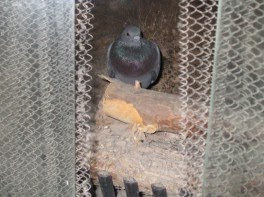 The fireplace was small, the pigeon looked calm, and I have a way with birds. "Hey, baby, it's okay, I'm going to take you outside now," I cooed as I pulled aside the metal screen. The pigeon did not know what was good for him. He flapped around the fireplace, sending clouds of stinging ash into my face. I tried to do it gracefully at first, but after a while I just grabbed at whatever presented itself - feet, tail feathers, wings. At last I got a grip on something, then took him between my hands and pulled him out into the room. He kept his wings spread--beautiful feathers! I could feel his heart beating fast. I carried him out the back door, opened my hands, and let him fly away. It's a good thing someone noticed him - he was in serious danger of starving to death before anyone saw him. Now I just have to clean up all the ash on the carpet. It was just as exciting as you described. She is so proud of finding the bird. She just wishes that one had sat on her shoulder too.